The 5.3km route will comprise four lanes of highway, with additional lanes to provide for traffic movement between the interchanges. 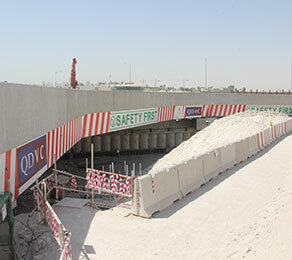 CCL was approached to provide a solution for the building of a temporary bridge as part of the Lusail Expressway, which would allow construction work to continue in the adjacent area whilst the temporary structure was erected. The response from CCL was to design a specialised grout cap, which was installed at dead-end anchors so that the stress could be applied at one end only, leaving the adjoining area unaffected. CCL’s fleet of specialist equipment and engineers in Qatar enabled the company to respond quickly to the request and carry out the work at very short notice.